Wolfenstein 3D - The Claw of Eisenfaust © 1994 Imagineer Company, Limited. 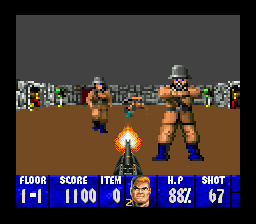 Wolfenstein 3D is a first person shooter by Id Software and conversion of their own game originally released for PC Computers in 1992. The game stars B.J. Blazkowicz, a fearless soldier trying to infiltrate a military prison base, the Wolfenstein Castle, occupied by the army of the Staatmeister. Each mission puts our hero to the test - he has, for instance, to uncover secret plans or stop crazy scientists before they can complete their chemical weapons. Each building is an intricate maze of narrow corridors, hallways, rooms, all filled with secret push walls, guards and giant rats. The players starts the game with a knife and a simple pistol but soon picks up machine guns, chain guns and missile launchers from defeated foes. Various special items also improve our soldier's status bar - they include first aid kits, food and extra lives. He can also find treasures scattered around each stage and ammo boxes. Interestingly, this Super Famicom version features a backpack allowing the player to store more ammo. Most of the stages have locked doors and keys are required to open them and advance through the game - keys are usually hidden around the levels or guarded by mean bosses. A map is gradually filled in as the game progresses to help B.J. Blazkowicz fulfill his mission. After each stage, the player is given his score but most importantly his percentage of enemies killed, treasures collected and secrets discovered - this features greatly motivates the player to play the game's stages again and try to reach a perfect 100% score. There is a password save feature in Wolfenstein 3D allowing the player to revisit any stage from the game. The game was presented at the Famicom Spaceworld' 93 in August 1993 in Japan for 9800 Yen. The Super Famicom version of the game was censored to comply with Nintendo's strict censorship policy. All the Nazi and World War II controversial references (Nazi signs, Hitler portraits, German language, skeletons etc...) were omitted. The blood was also removed and attack dogs replaced by giant rats. The game also features entirely new levels and two new weapons not found in the original game - the flamethrower and the missile launcher. [US] "Wolfenstein 3-D [Model SNS-6W-USA]"
[EU] "Wolfenstein 3-D [Model SNSP-6W]"